At last weekend’s show, the Championship classes had champion-style ribbons all the way through the placings. I’m familar with the blue-red-yellow of the champion ribbon and of the red-yellow-white of reserve champion. I even have a third place, year-end ribbon that is yellow-white-pink. I’ve don’t recall seeing them down to eighth. A championship ribbon is composed of the placing as the center streamer and main color with next two placings as secondary colors. The Wiki entry on horse shows has a list of ribbon colors. Championship fourth place: white, pink, green. Championship fifth place: pink, green, purple. Championship sixth place: green, purple, brown. Championship eighth: brown, grey, baby blue. wow. those are some impressive ribbons! 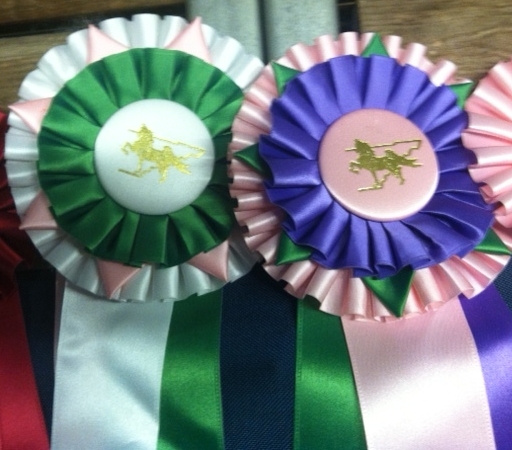 Saddleseat knows how to do ribbons! And prizes! No subtle, understated fake silverplate here. So much more fun. maybe I should take up saddle seat. Or gaited? I’ve talked with folks who rode Paso Finos when they had too many body issues to ride other breeds. I’ve ridden a Tennessee Walker once; i finally figured out how to get it to do that running walk and it was very smooth. 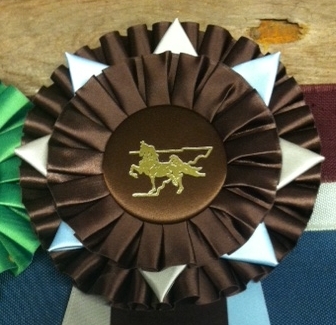 Years ago I tried to get our local swim team to order horse-show style ribbons for their championship meet instead of the cheap, single strip they always handed out. county fairs and quilt competitions could take some lessons in the ribbon dept. from the saddleseat riders.